"Special thanks to Azadeh Hasanzadeh who wrote this fantastic post"
The data type variables define the type of data and the format can be stored in it. In case of data types we can divide programming languages to 3 groups. Typed languages: You should declare the data type. In this example as C is a low level language the HEX values of 2 as a character will be placed in s.
Strongly typed languages: In these languages not only you should declare the data type but also you should be aware of data type conversion. C# is in this category. In C# you will face a compiler error if you try to assign a character in integer type unless you as a programmer accept the responsibility. As I said above C# is a strongly typed language and data type conversion happens under especial circumstances. It means: smaller data types can be converted to bigger but not the opposite. Let's explain it in an example. There are three variables. One is short, the other is an int and the last one is a long. You simply can convert short to int as int data type accepts a wider range of numbers that includes short data type, but you can't convert long to int. unless you accept the responsibility of loss of data that may happen during the data type conversion. This acceptance is known as Cast. Pay extra attention that in casting you will lost the most valuable bytes of data. First of all we will have our examples as a console application which is free from interface. From start menu select Microsoft visual studio 2005. Select the options as shown in the figure 1. Type a Name for your project and browse for its location. 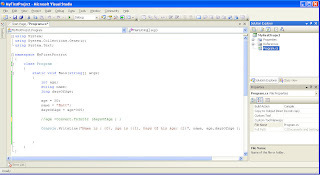 The main window of the .net environment will be shown. In the left pane (solution explorer) you can see "MyfirstProject" as you chose for your project's name. 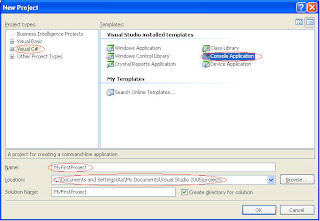 In the source code environment you can also see "MyfirstProject" as the name of the namespace. There is a class named Program. You can change it to whatever you like. The only thing you need to do is select the name of the class from the solution explorer, press F4 or select view/properties windows to see the properties of the class, and then easily change the File Name to your desired name. Pay attention that the class name in source code will be changed. In the "Program" class you are able to see a method called Main which is the main method of the class exactly as it was in C. We will talk about it later. If you click run button ( ) or press F5 you will face an error that its explanation is shown in the bottom of the page. This is exactly the case we talked about before. Then you will say to the compiler that you are aware of possible loss of data. So that compiler won't have any responsibility against this matter. This is the complete code for our first project. Just type it as it is in figure 3. Don't worry about the syntax you don't know about. We will discuss about them later. Running a project in .net is with F5 and it start debugging the project, but if you do that you will see that the result is shown so quick that you may not be able to see it. So ctrl+F5 (start without debugging) will give you the chance to see the result. means you are emphasizing that 10.5 is a float. Double and float data types round the digit and you can't have precision. So using decimal data type will solve this problem which doesn't round the digit. To convert a digit to decimal you can simply use m literal instead of casting. This shows that you are using d as a decimal value not a double.